Early on, a few intrepid pioneers dip their toes, the “hey look me over” phase. This is followed by a steep rise, middle peak, and finally, a period of waning frequency that characterizes so many natural and human social phenomena. Biochar, the ancient soil amendment of the Amazon, fits this trend perfectly. A recent issue of CSA News reported that there were about a dozen scientific articles on biochar in 2000. By 2012, the count had risen to 3,000-plus. Biochar is hot, the next be-all, cure-all promising not only to rejuvenate soil, but to foster agricultural resilience, globally, while mitigating climate change all in one sweet carbon-negative swoop. Or so the fanboys claim. Our group was bitten by the biochar bug in 2008. More to the point, a few shekels (and I mean a few) were cast our way to test biochar effects on soil properties and crop response. This was the peak of the bioenergy craze. As biochar is a co-product of biodiesel production, bushels of the black gold were foreseen to amend our sandy, nutrient and organic matter deficient southeastern Atlantic Coastal Plain soils. Carbon credits via cap-and-trade were also touted as incentives for growers to work biochar into their fields. Since our friends over in the Department of Biological and Agricultural Engineering were building a torrifier for biodiesel, it made sense to team up with them to validate some of the fantastic hype surrounding biochar. 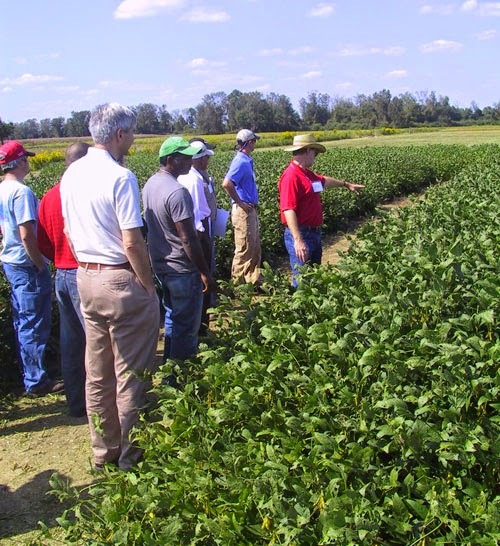 To this end, a replicated biochar trial was initiated in a corn-wheat-double crop soybean rotation at the Williamsdale Farm Biofuels Extension and Research Center in Duplin County, North Carolina. We tested five levels of biochar: 0, 10, 20, 40, and 80 metric tons per hectare, with and without N-P-K fertilizer (in English units this is equivalent to 0, 4.5, 9, 18, and 36 US tons per acre). These levels were chosen in order to capture soil and crop response over zero to mega-size doses of biochar. I'll skip the details of the experimental plot design, biochar processing, plot management, soil and crop sampling, etc. since they are summarized here and here. What I want to share presently and, inferentially, are some of the results we obtained now that five years of soil fertility data have been examined. 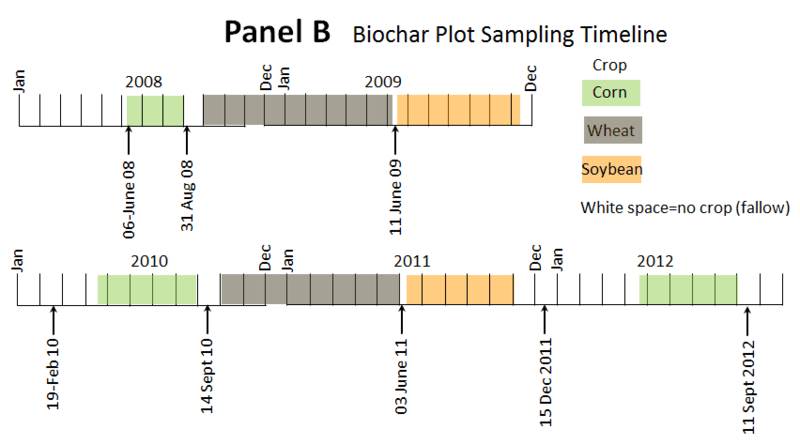 Panel A, below, portrays soil pH and cation exchange capacity (CEC) response from the time immediately after we incorporated biochar in August 2008, to after the third, and final, corn crop was harvested in September 2012. This time period covered 223 weeks, which is labeled on the horizontal axis. The actual soil sampling time line with respect to cropping is shown in Panel B.
pH and CEC are leading indicators of soil fertility routinely reported by agricultural testing labs, along with other information about plant-essential nutrients like phosphorus (P) and potash (K). To keep things simple, the curves in Panel A show pH and CEC response to two biochar levels, 0 and 80 metric tons per hectare (t/ha). Measured soil fertility indicators for biochar levels 0, 10 and 20 and, for biochar levels 40 and 80 were, in general, not different from each other. Eliminating these data avoids the unholy sin of chart clutter. Also note that the pH and CEC curves in Panel A are models showing the underlying trends predicted from the measured chemical data. This was done in order to “smooth out” the up-and-down tack observed between measurement dates due to seasonal fluxes, or random unknown factors in the environment. Without plunging too deep into statistics, the curves are random (mixed) effects models with time as a polynomial term, both by itself and interacted with biochar and fertilizer. We used a spatial power covariance structure, which accounts for correlations in measurement across time but allows for unequally spaced sampling dates as was the case in this experiment. None of the final pH and CEC models had a biochar x fertilizer interaction, so the data were pooled over fertilizer. In Panel A, predicted mean pH is symbolized in the legend by a red triangle or circle, and for CEC by a blue triangle or circle, for biochar levels 0 and 80, respectively. The vertical bars are confidence intervals, a statistical measure of uncertainty in the model estimates. What do the models tell us about biochar? Evidently, biochar increased soil pH and CEC by a significant amount. Panel A shows pH in the 0 level biochar plots at the first sampling date was 5.7, which is considered moderately acidic. The models further predict 80 metric tons of biochar as raising soil pH to a near-neutral value of 6.9, a change +1.2 pH units. This amounts to a little over ten-fold decrease in acidity because pH is measured on a logarithmic (base 10) scale. In fact, these values closely match the measured mean soil pH so we know the models are telling the truth. That’s always a good sign! Our raw, processed (<5mm diameter) hardwood biochar measured pH of 9.86 and had a calcium carbonate equivalent (CCE) of 3.75%. As such, biochar has a liming value, although paltry compared with other aglime materials like dolomitic limestone, which can have a CCE of up to 108% depending on impurities. Furthermore, mineral soils in North Carolina are limed to a pH of 6, which is considered slightly acid. This is because our soils are more highly weathered and naturally low in some plant essential micronutrients. Micronutrients like zinc, manganese, iron, and copper are most plant available under slightly acid conditions. A pH of 6.9 would induce micronutrient deficiencies so we wouldn’t recommend adding 80 tons of biochar under any circumstances. The pH curves in Panel A also show a gradual decline in soil pH with time. CEC also declined over the same period, but not exactly in parallel with that of pH. This suggests that pH and CEC are related (yes) but not independent of other unmeasured soil conditions. 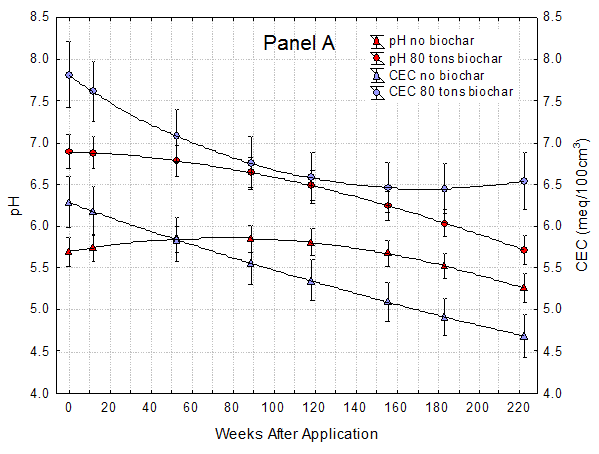 pH in the 0 biochar plots peaked around 100 weeks after the first measurement with the 80-ton biochar plots peaking at the beginning, then declining somewhat faster compared with the 0 biochar plots. In fact, both pH curves appear destined to converge sometime in the near future. In other words, at some point soil pH will equalize in the biochar plots, and this is exactly what the models suggest is happening. This is in line with our understanding of soil reaction under leaching conditions, but it’s nice to see the concept in play visually from experimental data. The biochar-CEC connection is a bit more provocative and I want to devote the rest of this blog to parsing that data. Biochar is reputed to have a myriad of positive effects: reducing nutrient leaching in soil; improving soil fertility and reducing fertilizer requirements; improving nitrogen uptake by plants; improving soil-plant-water relations; stimulating beneficial soil fungi; and sequestering carbon over long periods. Biochar has also been implicated in the formation of the prized pre-Columbian Terra Preta do Indio soils of the Brazilian Amazon. Given this fanfare, it's no wonder that biochar looks very promising as a carbon-negative, all-purpose soil amendment. Harking back to Panel A, our models predicted +1.6 meq/100cm3 increase in CEC immediately after incorporating 80 tons of biochar, even before adding N-P-K fertilizer. This represents a 23% increase in CEC over the 0 level biochar plots. Our raw biochar had a measured CEC of 27.6 meq/100cm3, which ranks in the “high” CEC category. It’s fair to question if a +1.6 meq increase is plausible, and if so, can we attribute that increase to biochar? Does the CEC lift represent a permanent improvement in soil fertility? What follows is an analytical sketch arguing that biochar (albeit in mega-doses) did in fact ameliorate the soil’s surface active properties leading to permanent improvements in fertility. It also attempts to explain why crop response to biochar in our research plots was indifferent. This will lean on some basic chemistry, but I trust that if you, dear reader, made it this far then a little tip-toe through the chemical tulips is no mental hardship. First, I computed the difference in available calcium (Ca), magnesium (Mg), and potassium (K) measured in the 0 and 80 level biochar plots which, together with exchangeable acidity, should sum up to the measured CEC according to NCDA ‘summation’ methodology. The estimated difference in CEC, +1.6 meq/100cm3, should agree with that of the calculated delta Ca, Mg, K equivalents (an equivalent weight is the atomic weight of an element divided by its valence; a milliequivalent is 1/1000th of an equivalent). The measured sodium level in all plots was very low so its effect on CEC can be ignored. The soil ammonium (NH4+) concentration was not measured, but I ignore it as well because normally the NH4+ concentration in unfertilized moist, warm, well aerated soil is very low due to nitrification. Table 1, below, summarizes the amount of Ca, Mg, K, and exchangeable acidity measured in the 0 and 80 level biochar plots, and their deltas (±change) at the beginning (pre-fertilizer) and at the end of the experiment (about two weeks after corn harvest). The sum of the Ca, Mg, K, and acidity deltas is 1.79+0.19+0.59−0.95 = +1.6 meq/100cm3. Thus, it does appear that the observed +1.6 meq lift in CEC from biochar is plausible, based on the sum of the component deltas at the beginning of the experiment. Can we attribute this to the surface activity of biochar? We can’t answer this question by analyzing nutrients from the first sampling date alone because a massive slug of 80 t/ha biochar may have super saturated the soil with high amounts of Ca, Mg, and K in solution. In fact, pH reached 7.6 and per cent base saturation (%BS) was 90-100% (mean of 94%) at biochar level 80 so a super saturated condition is plausible. The NCDA summation method does not discriminate between adsorbed and solution Ca, Mg, and K, a reason this method is unsuited for determining CEC in arid land calcareous and gypsiferous soils. This figure is slightly greater than the mean +1.6 CEC from biochar measured at the beginning of the experiment. However, the model mean CEC estimate from 11 Sept 2012 has a lower 95% confidence interval (CI) of 4.4 meq for biochar level 0 and, an upper 95% CI of 6.8 for biochar level 80, a difference of +2.4 meq/100cm3 which is also slightly greater than the lower and upper CI delta of +2.2 meq at the beginning of the experiment. A difference of 0.3 meq could therefore be explained by relative experimental error. For calcium, a delta of +346.6 mg/dm3 is equivalent to 775 kg/ha (692 lb/acre). For magnesium, a delta of +22.9 mg/dm3 is equivalent to 52 kg/ha (46 lb/acre). For potassium, a delta of +229.0 mg/dm3 is equivalent to 447 kg/ha (399 lb/acre). The total increase in nutrient holding capacity is 775+52+447 = 1,274 kg/ha (1,136 lb/acre). The conversion of nutrient mass per unit volume (mg/dm3) to mass per unit area (kg/ha), above, depends on two factors being true: (1) a sampling depth of 15 cm (6 inches); and (2) a soil dry bulk density of 1.47 g/cm3, which is calculated to have a soil mass of 2,240,000 kg/ha (2 million lb/acre). The first premise was satisfied, but dry bulk density varied with biochar (more biochar = lower dry bulk density) so there’s some error baked into the calculated increase in nutrient holding capacity. Never the less, the foregoing sketch suggests that the increase in soil fertility realized from 80 t/ha biochar was agronomically important. The amount of elemental calcium in one metric ton (1,000 kilos) of a standard aglime material like dolomitic limestone is 1,000 x 0.21 = 210 kilos (463 lb), and for elemental magnesium the figure is 1,000 x 0.12 = 120 kilos (265 lb). So, 80 metric tons of biochar is equivalent to the elemental calcium in 775/210 = 3.7 t/ha (1.6 US tons/acre) dolomitic limestone and the amount of elemental magnesium in 52/120 = 0.43 t/ha (0.19 US tons/acre) dolomitic limestone. The amount of elemental calcium and magnesium in our biochar was therefore unbalanced relative to that of dolomitic limestone (raw biochar had a Ca:Mg ratio 10.4). Now the puzzling part…why didn’t we see a positive yield response from corn, wheat, and soybean? I have a theory, and it goes like this: the calculations above show that even a low CEC soil, such as our Noboco sandy loam (CEC = 6.3 meq/100cm3), already has enough holding capacity for several thousand pounds of plant essential nutrients like Ca, Mg, and K. The +1.6 meq CEC lift from biochar represents an excess capacity that, under good management, crops are not likely to “see” because there’s no shortage of nutrients to begin with. The idea that sandy, southeastern Atlantic Coastal Plain soils have a meager capacity to retain nutrients, as commonly held, is not always true. What is true is that these soils are inherently acidic, high in exchangeable aluminum, low buffer capacity, and low in plant essential nutrients. But we have long understood how to manage these problems. Nowadays, corn yields of 250-300 bushels per acre, and soybean yields pushing 60+ bushels per acre are common in the southeastern Atlantic Coastal Plain. The situation is very different in the tropics where farming practices like ‘slash and burn’ and ‘slash and smolder’ prevail. There, mineral soil beneath the native vegetation is likely to be very acid, leached, and low in plant-essential nutrients. Some tropical soils develop strong anion exchange capacity (net positive charge on soil mineral particles) in contrast to cation exchange capacity in temperate zone soils. It’s no surprise, then, that most of the documented positive effects of biochar have come from such places. But what of the legendary “terra preta do Indio”? In fact, the origin of these soils is obscure. We know that the terra preta are anthropogenic. What we do not completely understand are the physico-chemical transformations that charcoal undergoes, buried in the Earth for centuries, which may impart properties quite different from modern-day biochars. Biochar has a liming value. Amending soil with 80 t/ha biochar increased pH to a near neutral value of 6.9. The target pH for agricultural soils in North Carolina (and much of the southeastern Atlantic Coastal Plain) is 6.0. Liming mineral soil to pH >6 could induce micronutrient deficiencies and is not recommended. Biochar increased CEC +1.6 meq or 23%, a plausible improvement in nutrient holding capacity and thus, soil fertility. The improvement in nutrient holding capacity was estimated as +1,274 kg/ha (1,136 lb/acre), an agronomically important amount. The ratio of calcium to magnesium in our biochar was unbalanced relative to that of dolomitic limestone. Crop response to biochar was indifferent (corn, wheat) or negative (soybean). We can’t explain the yield loss in soybean in 2009 (Figure 1), but corn and wheat yields indicated that, despite the CEC boost, biochar had no positive effect on these crops. In fact, the calculations shown here indicate that even a low CEC soil such as our Noboco sandy loam has more than enough nutrient holding capacity for row cropping even when soil pH is between 5.8 - 6.5 and base saturation is ~50-80%. I would argue that +1.6 meq represents an excess exchange capacity that, under good management, is of little consequence to crops. Figure 1. Biochar plots in soybean. Although lush looking in this picture, soybean grain yield in 2009 was depressed by biochar, shedding 1,142 kg/ha (-17 bushels per acre) under 80 t/ha biochar compared with plots receiving no biochar. But what about carbon sequestration? Wouldn’t biochar help with climate change? After all, biochar from woody feedstock can be up to 90% carbon (Antal and Grønli, 2003); is bio-stable in the environment (Lehmann et al., 2006); its smokeless production is carbon-negative (Lee and Day, 2013; Marris, 2006); and, many agricultural soils, especially in the southeastern Atlantic Coastal Plain, are low in organic matter from exhaustive plow tillage (Bauer et al., 2006; Novak et al. 2009). Lee et al. (2010) estimated that 3.25 giga-tons (Gt) of biochar could be realized from a global annualized biomass production level of +6.5 Gt carbon per year. In turn, this could be stored in the soil or in underground reservoirs, offsetting 11.9 Gt of CO2, or about 38% of the world’s annual 8.67 Gt carbon per year of fossil fuel CO2 emissions, according to the authors (later modified as waste biomass of about 3.3 Gt carbon per year, 1.65 Gt biochar-C, offsetting 19% fossil fuel CO2 emissions, but I won’t protest). What’s not to like? Yah, if it was only that easy. Scientists are genius at cooking up rosy (or baleful, depending on your point of view) scenarios but the bottom line is that it’s the economics, stupid. Absent from the biochar vision is a practical, economical way of realizing carbon sequestration on such a grand scale. Even at the farm level, the economics of carbon sequestration are daunting. Using current technology, the wholesale cost of biochar runs about US $220 per metric ton (Miles, 2009). As noted earlier, we did not observe significant improvements in soil pH and CEC (among other soil chemical and physical properties) with under 40 t/ha biochar. The cost per hectare for such a treatment would be US $8,800, or $3,563 per acre! Biochar production and storage in the soil or in reservoirs on a global giga-ton scale would entail absolutely staggering costs, never mind the transportation and machinery needed to emplace it. My aim here isn’t to denigrate biochar. I’m glad to have had the opportunity to study it. But like so many concepts that appear as revolutionary, paradigm-shifting brain waves, I fear the biochar mystique is more hype than material. 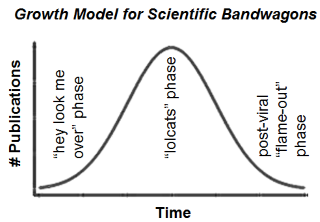 Twenty years from today, I predict that biochar will have faded into the hive mind background. Isn’t that how bandwagons go? Atkinson, C.J., J.D. Fitzgerald, and N.A. Hipps. 2010. Potential mechanisms for achieving agricultural benefits from biochar application to temperate soils: a review. Plant Soil 337(1-2): 1–18. Bauer, P.J., J.R. Frederick, J.M. Novak, and P.G. Hunt. 2006. Soil CO2 flux from a Norfolk loamy sand after 25 years of conventional and conservation tillage. Soil and Tillage Research 90(1–2): 205–211. Lee, J.W., B. Hawkins, D.M. Day, and D.C. Reicosky. 2010. Sustainability: the capacity of smokeless biomass pyrolysis for energy production, global carbon capture and sequestration. Energy Environ. Sci. 3(11): 1695–1705. Lee, J.W., B. Hawkins, X. Li, and D.M. Day. 2013. Biochar fertilizer for soil amendment and carbon sequestration. In: Advanced Biofuels and Bioproducts. Springer, New York. Lehmann, J., J. Gaunt, and M. Rondon. 2006. Biochar Sequestration in Terrestrial Ecosystems – A Review. Mitigation and Adaptation Strategies for Global Change 11(2): 395–419. Marris, E. 2006. Putting the carbon back: Black is the new green. Nature 442 (7103): 624–626. Disclaimer: Links to digital content in this blog are for the reader's information only, not an endorsement of that content.